Settled in the altiplano of Guatemala with views across four volcanoes, the town of Chuacruz is surrounded by cornfields through which the November winds whistle. The site of a massacre during the 36-year armed conflict in Guatemala (where more than 200,000 people were kidnapped, murdered or disappeared in state-led scorched-earth campaigns and assassinations), this Kaqchikel Maya town has been built by the strength of the women and children survivors who were determined to find a way to overcome their traumatic loss. Antonia is one of the eight founding widows of the WaqxakiKan (Eight Threads) Weaving Cooperative from Chuacruz and has played a pivotal role in establishing and developing relationships with Fair Trade Organizations (FTOs) to help find export markets for the high-quality backstrap woven textiles that the Cooperative has produced since its founding in 1985. Yolanda, the youngest of Antonia’s three children, was born in the midst of the armed conflict in 1978. She represents the new generation of young women in this town dedicated to continuing to help empower women in their community. For as long as she can remember, Yolanda has attended cooperative meetings with her mother. Even before she can remember, she attended meetings as a newborn snugly carried on her mother’s back in the traditional style, as most of the women in the cooperative still do today. Yolanda gained an insight into the advantages for women of working in a cooperative — something that has become even more evident to her as she has grown up and come to know firsthand the multiple barriers that women from her small community face in becoming successful entrepreneurs. Yolanda herself has strived to overcome these barriers and reflects on how attending school permitted her to embark on the journey that has led her to where she is today: “The most important thing in my life is to have graduated from high school. Without the work my mother did with the cooperative, she wouldn’t have been able to send me to high school, and without school there are many things I would never have learned.” Yolanda, her brother and her sister have all graduated from high school. Yolanda gives thanks to the WaqxakiKan Weaving Cooperative’s work in reaching out to other FTOs. Her mother and other members of the group have benefitted from a sense of community and common purpose that is borne out of interwoven lives and a unique connection. Without this, she feels she would not be the woman she is today. Yolanda recounts how, when she was young, it was rare to find a community member who had graduated from high school, much less a woman who accomplished this. The majority of men in the community of Chuacruz are agricultural workers. Earning as little as $6 per day, they struggle to provide for their families’ basic needs. Married women who participate in cooperatives in Guatemala commonly do so only with their husbands’ approval. While it often comes from an economic need for women to contribute to household income, working also provides an opportunity for women to access informal learning opportunities. The son of WaqxakiKan Cooperative member Matea, 20-year-old Santos, talks about how his mother’s participation in the cooperative has contributed to their lives: “I remember my dad giving my mother permission to participate with the other women, as his work couldn’t provide enough for us to survive and go to school as well.” He adds that the benefits he’s seen from the women’s participation in the cooperative include their acquisition of new skills and knowledge, which they are passing on to his generation. 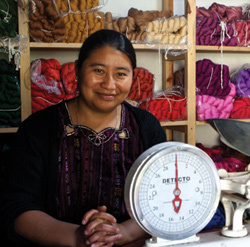 The WaqxakiKan Cooperative established a relationship with Guatemala-based FTO Maya Traditions in 1994, dedicated to the self-development of weaving cooperative members in the altiplano of Guatemala. This, in turn, resulted in increased access to education for women and youth in Yolanda’s community. Yolanda’s journey has at times been difficult. After graduating as a primary school teacher in 2001, and unable to find a job, Yolanda was forced to move from the isolated town of approximately 1,500 inhabitants to the capital city, Guatemala City, with a population of three million people, to work in a corner store. After five years in the city, Yolanda decided to return home to set up a thread store in the front room of her mother’s house in order to further support her mother and the Cooperative. Yolanda is now an integral member of the WaqxakiKan Cooperative. She was instrumental in registering the Cooperative as a legal association, which effectively permitted the women to receive more support from local non-profit organizations and to become a legitimate business entity. This year, thanks to the support of newer Cooperative members — all daughters of current members — Yolanda was able to help secure funding to train five women to learn how to sew their backstrap woven material into products for export. The impetus for this came from Yolanda’s participation in the Santa Fe International Folk Art Market in July of 2012. The Cooperative made a big investment in sending Yolanda to the event, and she recalls what an enormous responsibility and learning curve it provided for her. She realized that sales were very low due to a lack of understanding of their clientele, as well as the requirement to sell finished products rather than just woven material. On her return to Guatemala, Yolanda decided that the Cooperative needed to diversify the women’s skills. By allowing the group to both backstrap weave material and produce finished products, they could appeal to a wider market and potentially increase income. The Cooperative currently works with FTOs based in Sweden, Holland, the U.S. and Guatemala, and Yolanda has become a cultural facilitator for the women of her community and their affiliated global organizations. With the benefit of formal education and life experience, she has been able to navigate different cultures and languages (she speaks Spanish and two Mayan languages), helping to bring the voice and skill of rural artisan women to the forefront. Yolanda has been an important part of ensuring that access to incubator services which strengthen indigenous women’s entrepreneurial ecosystems can happen for marginalized rural populations in Guatemala. Reflecting on her experience, Yolanda says she is grateful that she had the opportunity to attend high school, endure her time in Guatemala City, and to have been able to share with her friends and family what it feels like to travel by air to a foreign land, far from her rural village. She feels indebted to her mother, and to the women who worked alongside her, for the opportunities she has had. She is successfully taking on the challenge of bringing the voice and artisanal talents of rural women in Guatemala to the forefront. At the same time, she is facilitating access to an outside world that, at times, is perceived as inaccessible to women in her community. In returning to her community, Yolanda has assured that the Cooperative can continue to provide fair wages to women in the ever-changing fair trade environment. Future generations of rural indigenous women can now rely on access to education and increased economic freedom, thanks to her. I knew Jane Mintz when she started Maya Traditions. I have seen some of the students at her sala in Jucanya working on a film project. Jane (Juana) passed 3 years ago, and it was very moving for me to see students as smart and savvy as the ones I saw working on their video project (forgive me for not remembering the wonderful woman who started this project. If anybody knows her name, please mention it here!) in Jane’s sala. Jane was a dear friend of mine, and I’m proud of her for giving so many people the opportunities mentioned in this article. We are missing Marcelle Rankin, who recently left Maya Traditions to start a new life in Austrailia,too!